Can I Cook Baby Carrots With Roast in a Slow Cooker? Slow cookers let you prepare your meal hours in advance, so you can come home to a savory cooked meal. Baby carrots are a tasty traditional accompaniment to a tender succulent roast, and you can cook both in your slow cooker. For an average 3-lb. roast, you can add the carrots at the same time you put the roast in the crock, but if you're cooking a larger roast, you may want to add the carrots later. The slow cooker contains a heating element in the bottom and/or sides of the exterior part of the cooker and an interior ceramic "crock" that retains consistent heat. When sealed with a lid, the slow cooker generates and maintains even cooking temperatures. The larger the roast, the longer it will take to cook. Most slow cookers heat food to a minimum of about 170 degrees Fahrenheit. On "High," the slow cooker reaches around 280 degrees. Unlike roasting in a conventional oven where you can uncover the roast at the end of the cooking time to brown the outside, the meat will not form a browned crust in a slow cooker. If you want a browned roast, sear the meat in a large skillet before putting it in the slow cooker. To sear, heat a heavy skillet on "Medium," and place the roast in the skillet, turning it to brown all sides. For nonstick skillets, use 1 tbsp. of vegetable oil to prevent sticking. Baby carrots often come prewashed, but rinse them thoroughly anyway before adding them to the slow cooker. No other special preparation is required for the carrots. Put the roast in the crock, and add your favorite seasonings. Pour a small amount of water into the crock, just enough to cover the bottom. When the roast is cooked, you'll have more liquid from the drippings. Layer the baby carrots on top of the roast and around the sides. The carrots will cook quicker than the meat, so don't place them beneath the meat. Larger roasts require longer cooking times or higher temperatures. Follow the cooking times in your recipe to ensure adequate cooking. Baby carrots added at the same time as a large roast may become overcooked and mushy. For the best texture, add the baby carrots to the crock two hours before the roast is done. 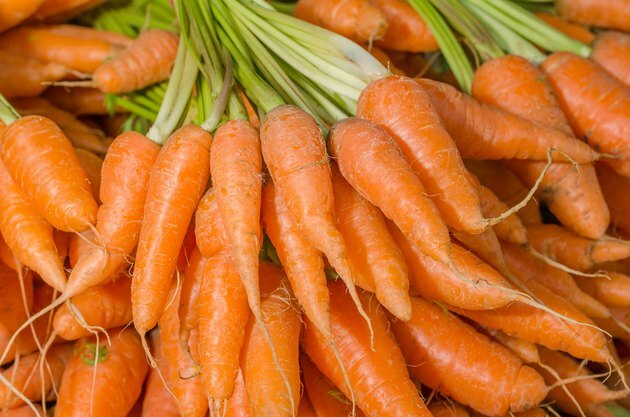 You may also substitute longer sections of larger carrots that will cook more slowly than baby carrots.